In these equations, the meaning of AGo is the same as given by Eq (9.34). Since the activity of M in the alloy must be less than unity, Eq (9.46) shows that the oxygen pressure, or the oxygen potential, is increased by dilution of M with the inert species P.
Although the solvent metal P is inert chemically, it constitutes an additional component as far as the phase rule is concerned. Applying Eq (9.35) with P =3 (as before) but changing C to 3 (M, P, and O) gives F = 3 + 2 - 3 = 2. The two degrees of freedom are temperature and composition, the latter being the mole fraction of M in the alloy. The stability diagram in Fig. 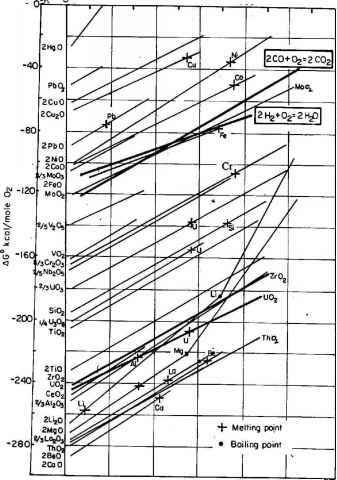 9.7 for oxidation of M in the alloy consists of a family of lines lying above but parallel to the line for pure M. Each line represents a different activity (i.e., mole fraction) of M in the M-P alloy.